I was excited to get to the venue and see the track. We showed up and walked in and were greeted with a really sweet looking track. Not quite as huge as the normal PNB track, but I thought it looked really good. The track is butter smooth, but you can feel all the sand in the packed track, I knew it would be getting rough pretty quick. Practice started on Friday morning and would last for a non stop 30 hours. My plan was to take my time and get everything ready before getting on the track for practice. I wanted to learn the layout in just a couple runs, then get some good practice late in practice when it starts to get rough. Practice went really good and I felt like I had the track down and my cars felt good, especially as it got more bumpy. I started with my cars setup really close to how I ran at Silver State. I really didn’t make any setup changes during practice, just focused on the track and getting comfortable. 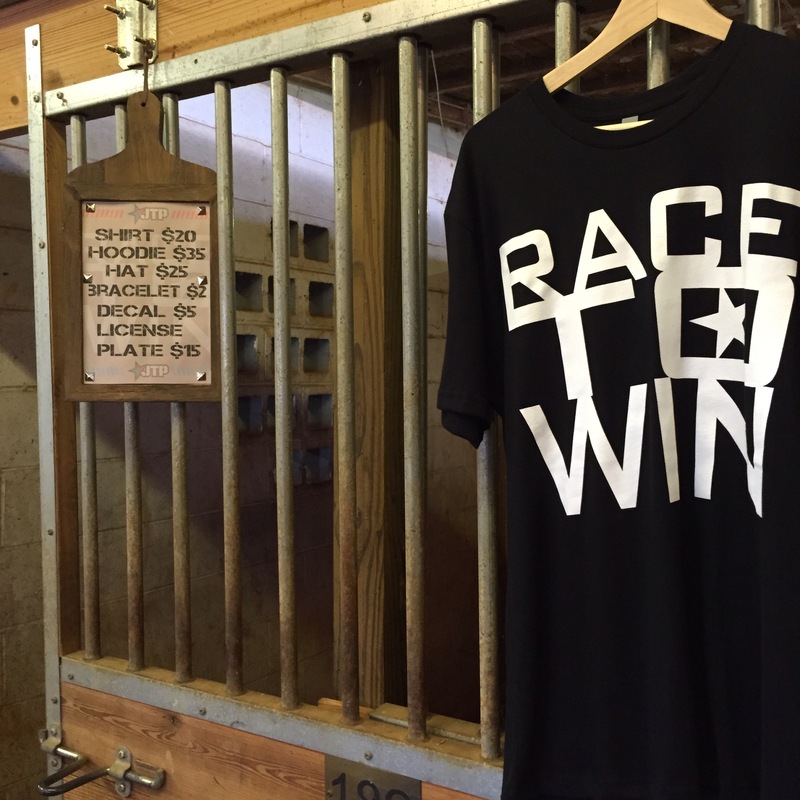 This weekend I debuted my new JTP shirt, Race To Win! I am really excited about this shirt and the meaning behind it. It is basically how I live my life everyday, striving to always do my best in everything I do. It was really cool to see some people wearing them after they bought the shirts. The main man behind the Psycho Nitro Blast, Dave, has all sorts of unique things around the track and pit areas. His specialty is special effects, and it was cool to see all the different things. Here is my MP9 on the flaming PNB car stand before qualifying gets underway. 1pm on Friday and it was time for qualifying. I was able get some good practice in before the track closed down, so I was getting the feel for the now bumpy track. With 500 – 600 race entries, I knew the days were going to be long, so I was eager to get racing started. 1/8 Electric buggy was up first. I only practiced one time with my MP9e, but it felt really good, and it was setup just like my nitro powered MP9. Q1 got underway and I was feeling great and getting in the flow of the track. I lead the whole heat and took the Q1 TQ. The track was really shaping up nice and you could get creative with your lines. Next was Truggy, and I was ready. 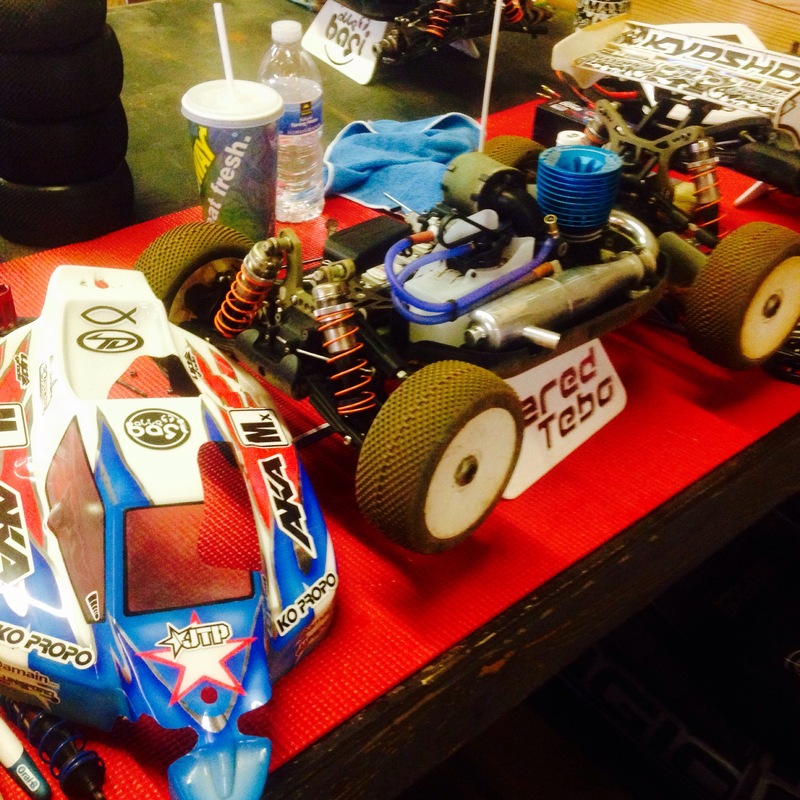 My MX engine was running great in practice and my STRR was working good. I’ve been trying some different things on my truck lately, and it is really getting better. This weekend I put on MP9 caster blocks and steering knuckles, and my steering feel increased. All qualifiers were 10 minutes, and I was “Racing to WIN”, so I was planning on not pitting. The race got underway and my truck was awesome and just like E-Buggy, I lead the whole heat and took the win and the TQ. The no pit gamble paid off, and I still had enough fuel to do a couple more laps, even with the 46 – 47 second lap times. Last to run was Nitro Buggy, and I was ready to finish off a great day. 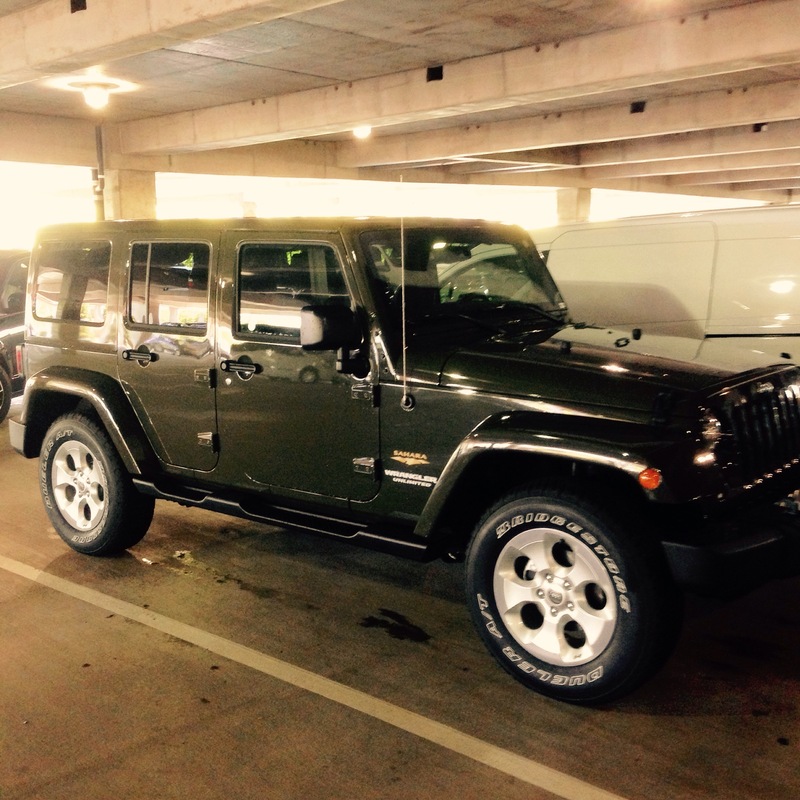 My car was ready, engine was tuned, I had my lines picked out, it was time to do work. Just like truggy I had no plans to pit during the qualifier. I started out strong and was feeling the flow and really enjoying the track. I lead the whole heat and had a 10 second lead with 40 seconds on the race clock left. I hit the deja vu section, “wooden rollers,” and when I went up the second roller, my engine died and just rolled to a stop after going down the backside. I wasn’t out of fuel, but I was now out of contention for the TQ. I was a little off my normal line, so maybe I hit a nail or something. I got re started and finished, losing around 65 seconds, but most importantly I finished 14th for the round and would still be in the A heat after the resort. I was really bummed to give that TQ away, but I still had a great start to qualifying and all my cars felt amazing. On to Saturday! Saturday was here, and we would have Q2 and Q3, but again it would be long day, ending after midnight. 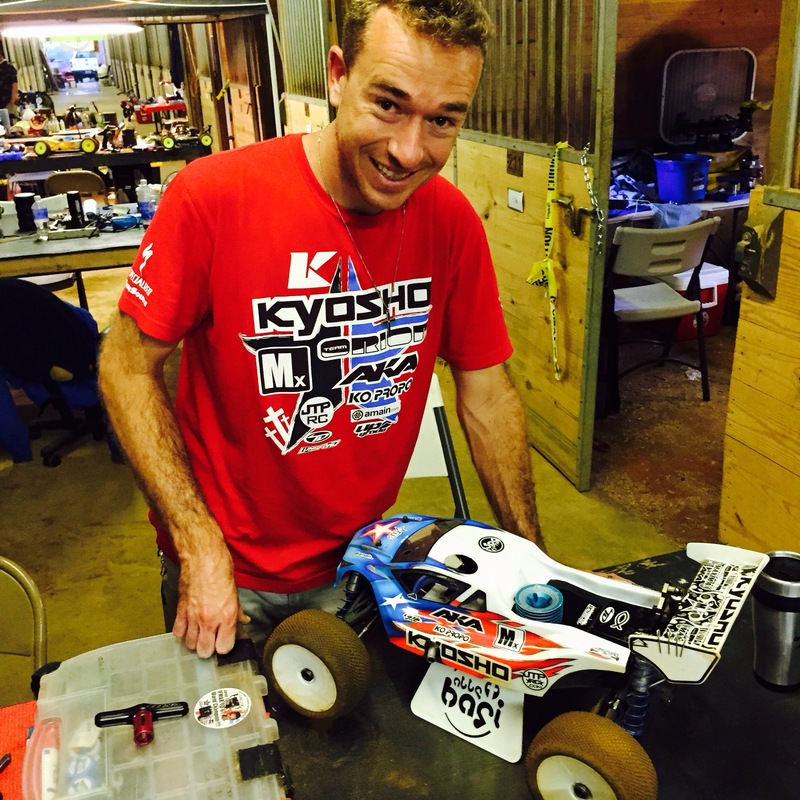 I had a good chance to lock up the overall TQ in E-Buggy and Truggy after Q2, so that was my goal. E-Buggy was first. The track was getting rougher and rougher with every heat, so lines were changing and it was suiting me more and more. I love the technical side of driving and being able to get creative on the track, so I was really enjoying myself on the track. Q2 started and my MP9e was driving really good, just hoping in and out of all the bumps. Just like Q1 I lead the whole heat and felt great, taking the Q2 TQ by 15 seconds, and securing the Pole Position for Sunday. Plan 1 for the day was complete, not on to Truggy. With the track getting rougher, I would take a look at the track a few races before my race was up. My STRR was ready and heat got under way. My engine was feeling a little richer than normal, so I was worried about fuel, as I was running the whole 10 minute qualifier without pitting. 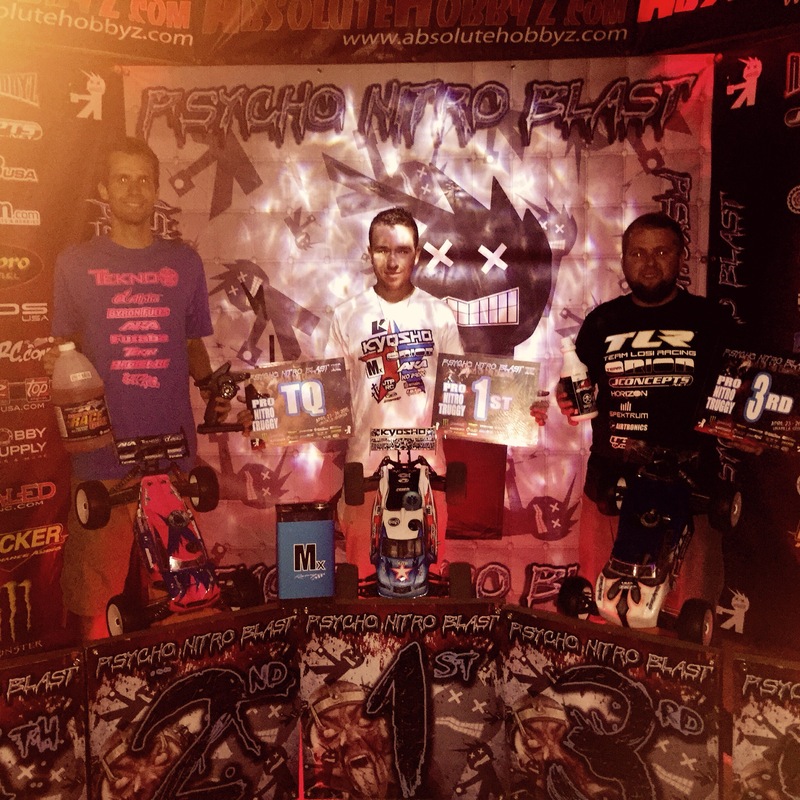 I was going really good and leading the heat, but really trying to be cautious and save fuel as much as possible, and I finished to take the TQ and the overall TQ. After the race I checked my tank, and there was not a single drop of fuel left in the tank, that was a close call, but the risk paid off. It was now time for Buggy, and time for revenge after the misfortune of Q1. My MP9 was feeling good, but now the track was really getting bumpy, causing all drivers to make multiple mistakes during the runs. There was a good 4 car battle for the lead for most of the qualifier, but at the end, I smoothed out and took the Q2 TQ. It felt good to get the program back in line with my MP9, and I wanted to start on Pole in all 3 classes. Q3 I had E-Buggy and Truggy locked up, so my main focus was on Buggy. When it was time for Buggy, the track was a mine field out there, with not too many good line options out on the track. I was having a decent heat, but I was making more mistakes than I have been making in other races. Maifield and I were really close for the entire heat, and I was in the lead with 1 minute left in the race. 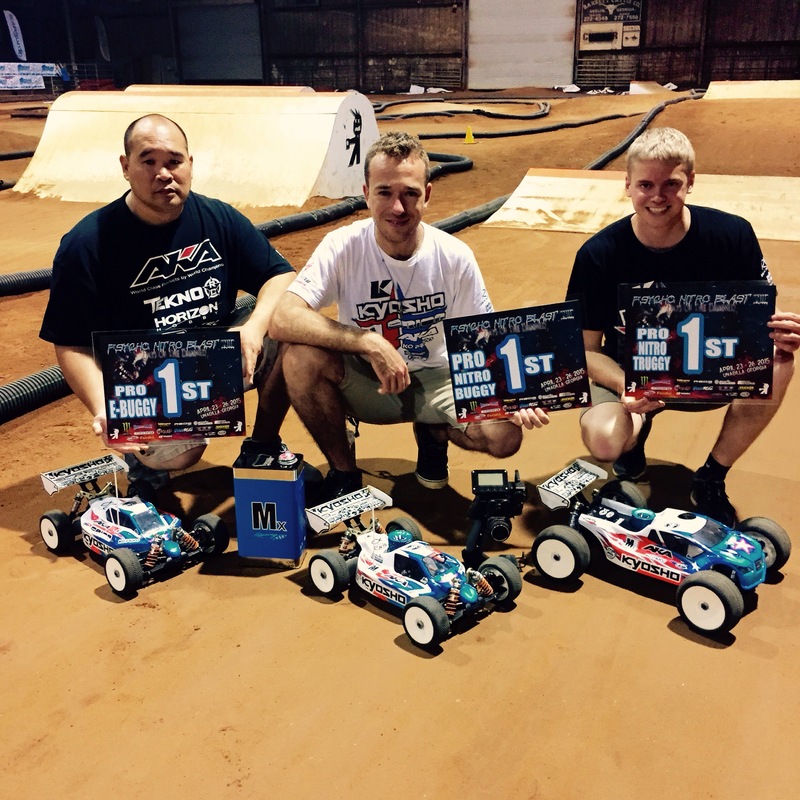 The TQ battle was between us two, so I needed to win the heat. I had a .7 second lead with two laps to go, but then I made a big mistake and crashed, giving Maifield the lead, the Q3TQ, and the overall TQ. I wasn’t too pleased with myself, but I needed to just step back and realize I was still having a great weekend. 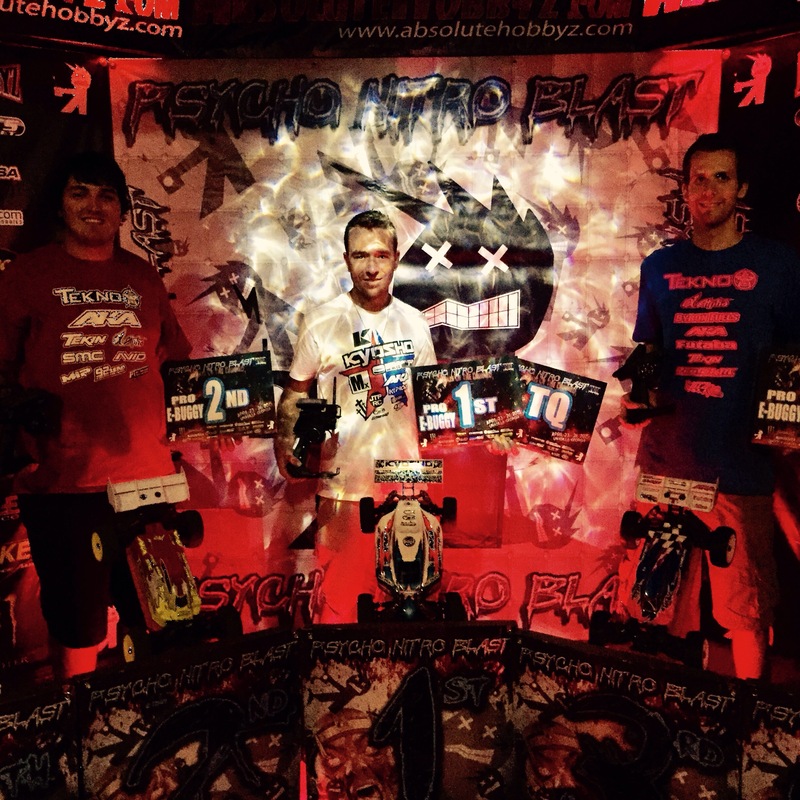 I TQed 6 of 9 qualifiers and was starting 1st, 1st, and 2nd, the weekend was going awesome! Sunday was finally here and it was race time. I was feeling confident and feeling like the full sweep was possible. We showed up to the track and we greeted by the site of a few sections of track being fixed. 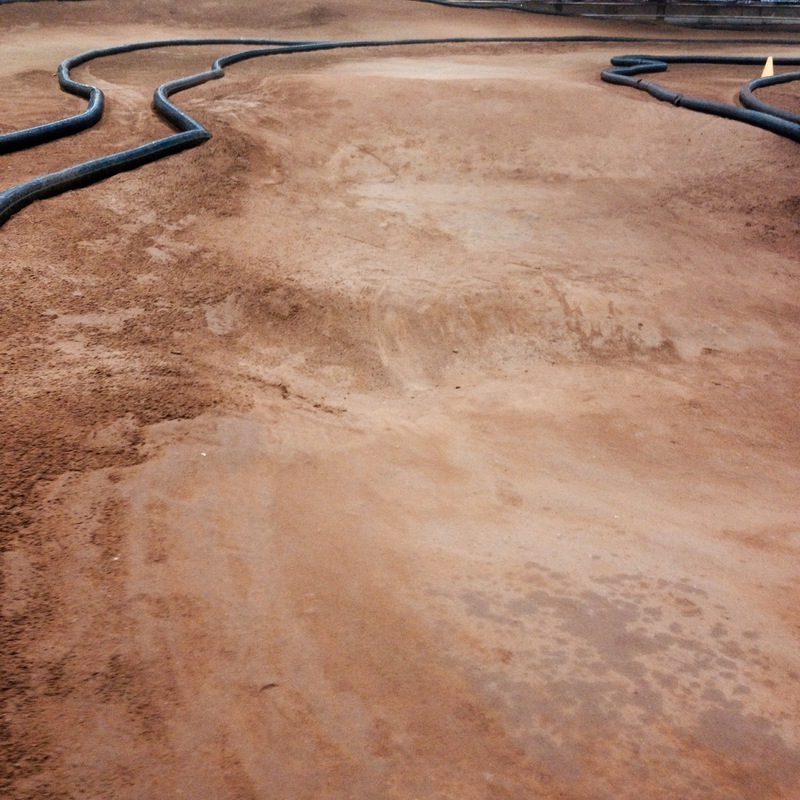 In Q3 of Buggy last night, the track was really really rough. They decided to smooth out just a few sections, mainly the fast sections of track that were getting really bad. I though the track looked great and that opened up the opportunity to get creative with line choice again, which I love. No A-Main practice, so it was straight to race time. First up was E-Buggy A1. E-Buggy would have double 10 minute mains, with both main finishes counting. Truggy and Buggy would be a single 45 minute main. E-Buggy A1: I got off to a pretty good start, but then got caught out by a huge bump a few laps in and was dropped back to 4th. With only 2 laps of warm up, it wasn’t quite enough time to search and feel all the lines, so I had to explore a little while racing the main. By the halfway point I had my lines down, worked myself back into the lead and started to pull a lead. My MP9e was really feeling good, and I was having fun. I took the A1 win! 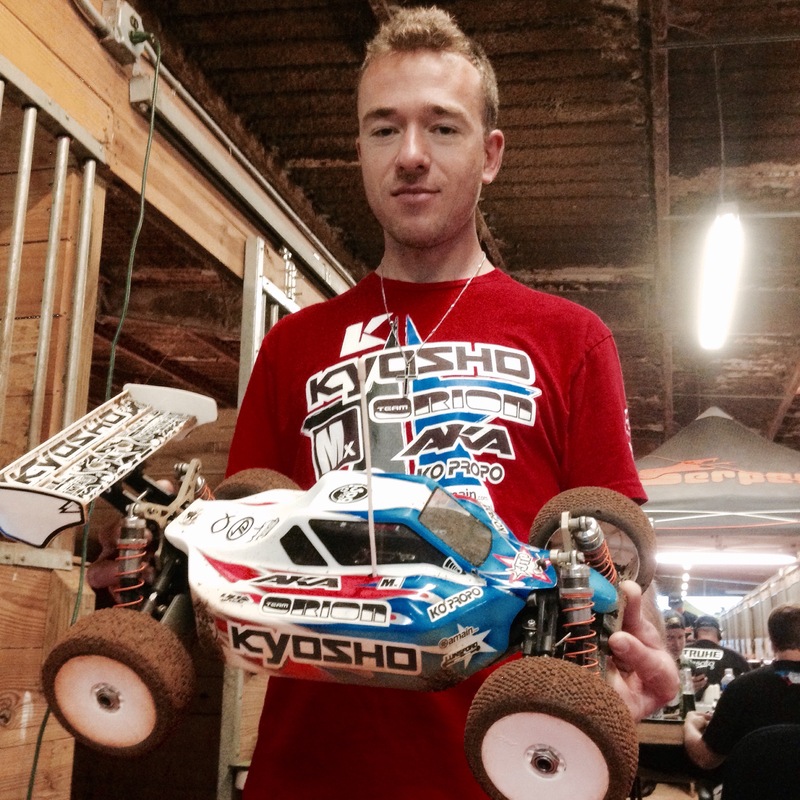 E-Buggy A2: I really wanted the win, and knew I just needed to drive like I have all weekend to get it done. Again I got a good start, but this time I knew the lines better than A1, so I was able to keep clean and not lose the lead. Maifield had a really rough A1, but in A2 he tried his best to stay close to me. I didn’t have to beat him, so I wasn’t too nervous, but I wanted to go out with a 1 – 1 performance. I drove smart and kept it clean to get the win and the E-Buggy Overall Championship! The 45 minute Truggy main was up next. I had my STRR all ready and I was excited to get the main going. JLAME was a little nervous as this would be his first time ever pitting a 45 minute main, don’t worry buddy, nobody is watching 🙂 I was starting from the TQ position and was going to be doing a 9 minute pit strategy. The start of the main was good and I kept the lead. The track was starting to get rougher, but the line options were still there. Lutz and Maifield were in tow behind me, but they were having to push to catch up, and were making more mistakes than I was. JLAME and Pres made perfect pit stops every time and the main was smooth and went just to plan. I kept the lead for almost the entire main, giving it up for a few laps in the beginning, but leading at the end. It felt awesome to get the win and that was step 2 in the plan for the sweep! 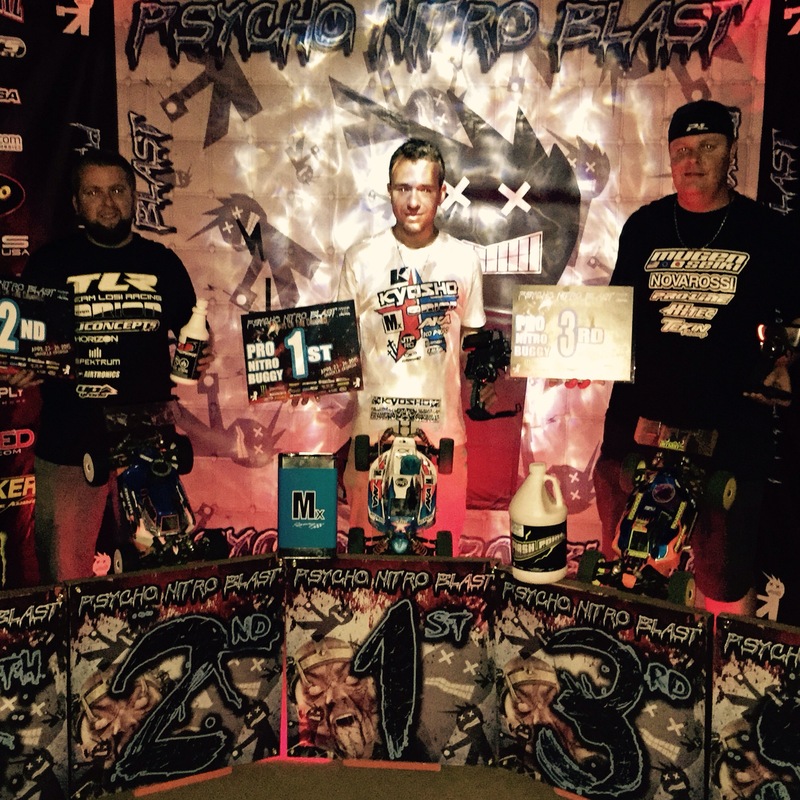 The final race of the 2015 Psycho Nitro Blast was 1/8 Nitro Pro Buggy! I was starting 2nd, behind Maifield, but I was determined to get the full sweep. 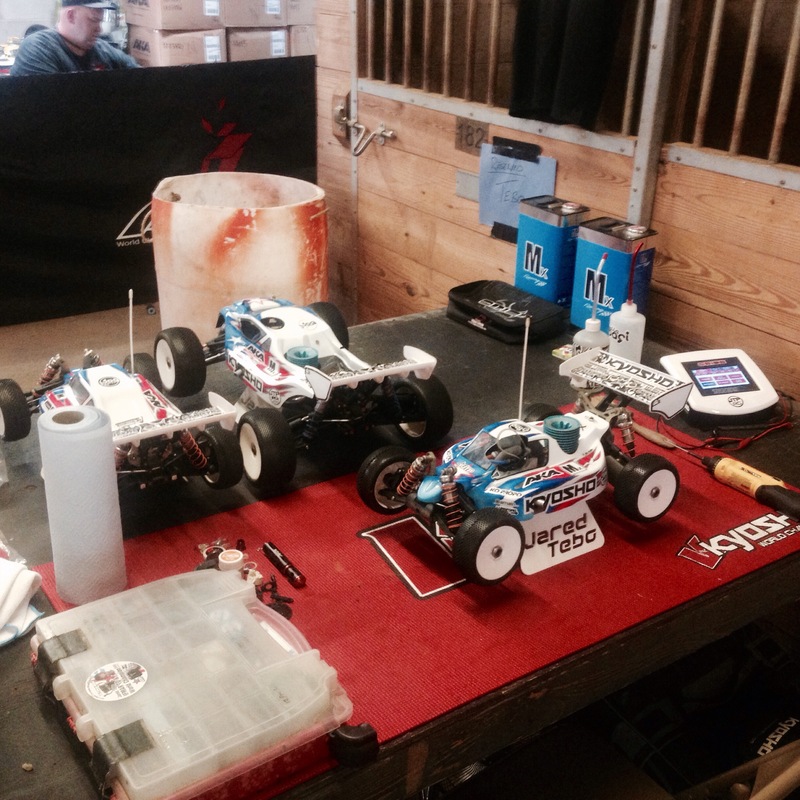 In the practice before the start of the main, my car was feeling great, so I was ready to battle. The tone went off, and we were racing. It was a good start and I was close to Maifield on the first few laps, but then a mistake would drop me back to 4th, and put me around 7 seconds back of the lead. I still felt confident, as I knew the track was gnarly, and mistakes were going to happen, I needed to focus and let the lead come back to me. I found my groove and started to reel in Maifield for the lead. I was able to get the lead after the first pit stop and then pulled a little lead after that. I would hold a 5 – 10 second lead for most of the race, but then it would get closer at the end. Maifield was pushing hard, and I got a little out of my groove with the difficult conditions. The race was only between us too, as we were a full lap ahead of 3rd, and 2 full laps ahead of 4th. We were both pitting at 9 minutes and both pit crews were similar in pit times, so it was just between us on the track to fight it out. In the final 10 minutes, Maifield got right behind after I made a costly mistake and crashed when I hit a HUGE braking bump in the center of the track. We was within 2 seconds of me for a while and we were matching laps and matching small mistakes. Who could find the edge the drive the closest to that edge, that was the game at the end of the race. I found my groove again and just tried to drive my own laps and not think about anything else. On the last lap, the lead was 3 seconds, but Maifield was pushing hard, too hard, and crashed. I drove around safe the final lap and took the win, making it 3 for 3 on the weekend! This was my first PNB experience, and I really enjoyed myself, obviously winning helps make it more enjoyable, but I am already looking forward to returning in 2016. 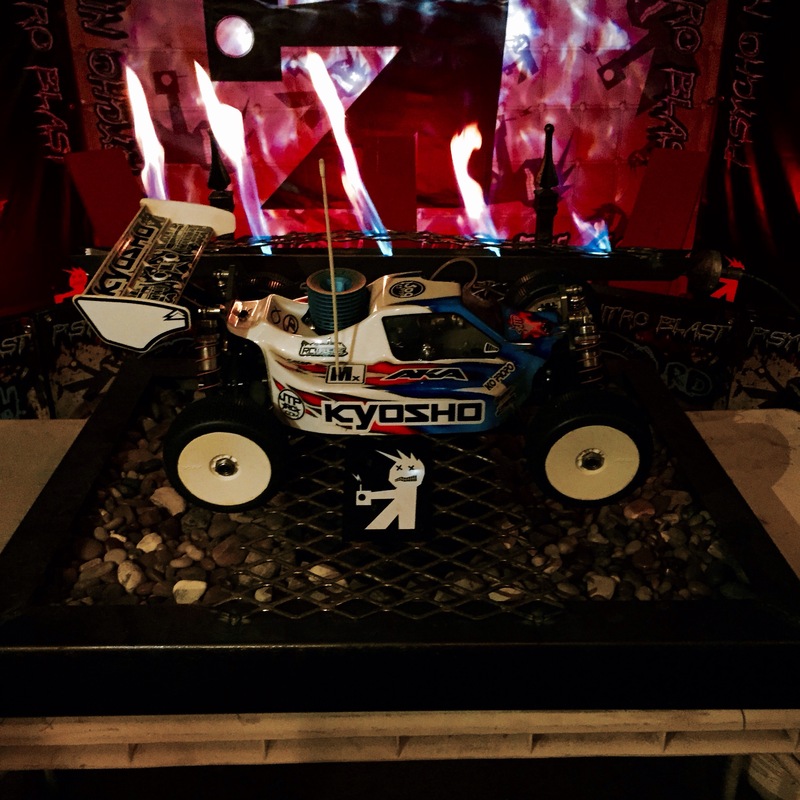 Thanks so much to Dave for the great hospitality, Pres for the pit help, JLAME for all great support, help, and pit work all week, all my great sponsors, Kyosho, MX, Team Orion, AKA, Ko Propo, Amain.com, JTP, Upgrade-RC, TD Paints, Lunsford, MIP, LiveRC.com, Bike Source, Specialized, Rock Brook Church, my family for always supporting me through the ups and downs of a racing career, and mostly, thanks to the Good Lord Jesus Christ. 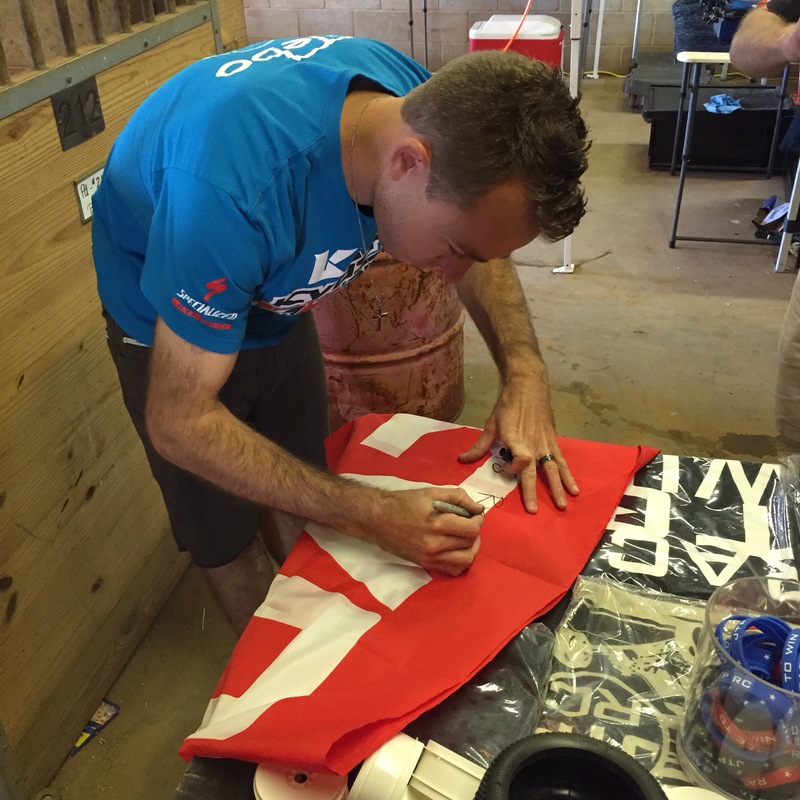 Hey, That was my banner you signed! Thanks a ton for taking the time to sign it. I wish I could have been there in person to get it signed. It is now hung proudly in my RC work area. I hope to meet you at the track someday! Yeah my confidence is coming back, so I’m enjoying it more. When I’m enjoying it, then results are normally better.